Dorota Anna Gozdecka holds a PhD in legal theory from the University of Helsinki (2009) and was awarded the title of a Docent of Jurisprudence by the same university (2015). 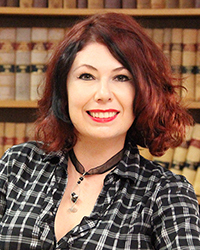 Her primary research area focuses on legal theoretical aspects related to the accommodation of cultural diversity and the intersections between law and the humanities. Her publications such as the Special Issue Identity, subjectivity and the access to the community of rights (Social Identities, Issue 4, 2015), the monograph Rights, Religious Pluralism and the Recognition of Difference: Off the Scales of Justice (Routledge, 2015) or the edited volume Europe at the Edge of Pluralism explore questions of otherness created by contemporary legal regimes. Dorota has previously held research fellowships at the UC Berkeley, the ANU Centre for European Studies and the European University Institute and has won prestigious research grants, such as the University of Helsinki three-year grant for an international research project ‘Law and the Other’ that she was leading as the CI in 2013-2015. She has also been an expert for the Council of Europe's Drafting Group on Human Rights in Culturally Diverse Societies in preparation of the new Guidelines on Human Rights in Culturally Diverse Societies adopted by the Council of Europe in 2016. Dorota is also the Associate Director of the Centre for Law, Arts and the Humanities (CLAH) and the author of the play 'Trumpsformation', which she staged in Canberra in March 2018 with the law and drama group Antigone. Hans Gieng’s 1543 statue Gerechtigkeitsbrunnen (Fountain of Justice) – the first known depiction of Lady Justice wearing a blindfold – conveys a statement that is understood by legal professionals and laypeople alike. Justice is blind. An international law researcher at The Australian National University (ANU) believes US President Donald Trump's executive order into travel restrictions will likely end up before the US Supreme Court, where it could be a win-win situation for President Trump. The human rights of migrants are not being respected in Europe with many countries failing to recognise cultural difference and diversity, according to ANU expert Dr Dorota Gozdecka. Antigone Law and Theatre Group is delighted to invite you to our performance of Trumpsformation. Our group is comprised of ANU students who came together to critically engage with law and humanities in a performative capacity and connect with other performing artists in Canberra. Antigone Law and Theatre Group is delighted to invite you to our performance of Rhinoceros by Eugene Ionesco. Our group is comprised of law and art students who came together to critically engage with law and humanities in a performative capacity. Recent executive orders issues by President Donald Trump have shocked many and created an unprecedented travel crisis. This workshop aims to challenge the preponderance of words in legal education and address the growing need of thinking of law in its current setting that is highly influences by changing imageries, visual media and technological progress utilising different means of perception. Dorota's primary research area focuses on legal theoretical aspects related to the accommodation of cultural diversity. Her recent publications explore questions of otherness in contemporary legal regimes. Dorota looks at how law, primarily human rights law, creates, maintains and struggles with otherness. Issues related to the recognition of difference and the place of the other have recently led her to focus on law and humanities and explore the relationship between law and image in the area of migration law. Dorota examines the interconnectedness of legal justifiability and legitimacy with the dominant images of migrants and examines how these imagery is reflected in the recent changes in migration and refugee law. Dorota has previously held research fellowships at the UC Berkeley Institute for European Studies (2013), the ANU Centre for European Studies (2012-2013) and the European University Institute (2008) and has won prestigious research grants such as the University of Helsinki three-year grant for an international research project ‘Law and the Other’. Within that project she led a team of 9 researchers working at 5 universities worldwide and published several publications including a collected volume and a special issue 'Identity, Subjectivity and the Access to the Community of Rights', Social Identities, Issue 4, 2015. Gozdecka Dorota A., Koulu Sanna, 'What to do with the other in human rights law? Ethics of a;terity versus ethics of care' in: Anne Griffiths, Mustasaari Sanna and Anna-Maki-Petaja-Leinonen (eds. ), Subjectivity, Citizenship and Belonging in Law: Identities and Intersections, Routledge, 2016, pp. 171-190. Gozdecka Dorota A., Ercan Selen A., ‘A Critical Assessment of Post-Multiculturalist Tendencies in Law and Policy’ in: Dorota A. Gozdecka and Kmak Magdalena (eds. ), Europe at the Edge of Pluralism: Legal Conundrums of Accommodating Diversity in Europe, Intersentia, Ius Commune Europaeum series, Volume: 134, 2015, pp. 27-42. Gozdecka Dorota A., ‘Europe’s changing approach towards blasphemy.’, in: Murphy Cian C.(ed. ),‘Law and Outsiders: Norms, Processes and 'Othering' in the 21st Century’, Oxford, Hart Publishing, 2011, pp. 233-248. Gozdecka Dorota A., ‘Catholic Family Values instead of Equality - Polish Politics Between 2005-2007 Envisioning the Role of Women.’, in: Sulkunen Irma, Nevala-Nurmi Seija-Leena, Markkola Pirjo (eds.) ‘Suffrage, Gender and Citizenship - International Perspectives on Parliamentary Reforms’ Cambridge: Cambridge Scholars Press, 2009, pp. 427-448. Gozdecka Dorota A.,’Towards a Legal Definition of Religion in Europe. Religious Problems in Contemporary Europe’, in a yearbook: ‘Law: The 6th International Conference of PhD Students, 12-18 August 2007’ Miskolc: University of Miskolc ITTC, 2007, pp.103-110. 'Migrants and politics of visibility: who can and cannot be seen', Complicities, Law, Literature and the Humanities Conference, UTS, 9-12.12.2015. 'Representation of 'illegality': law, migrants and the power of images', Law and Society in the 21st Century Conference, University of Oslo, 10-12.6.2015. 'Postmodernism, post feminism - post-rights? ', Post feminism. Post theory. Post critique? Workshop, ANU College of Law, 15-16.5.2015. ‘Thinking in Pictures: challenging textual interpretation in legal education', Law, Literature and the Humanities Association of Australiasia Conference: Interpellations, ANU, 5-7.12.2013. Jill Marshall, 'Human rights law and personal identity', Routledge in: Social Identities (2016): 1-4.